Yoko Ono is to re-stage her conceptual art project which saw her invite people to cut off her clothes until she was left naked. 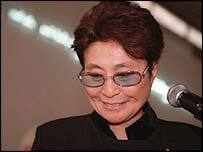 It was 40 years ago that Ono, widow of John Lennon, took to the stage in Japan for Cut Piece. Now Ono, 70, will recreate Cut Piece in Paris on 15 September in an effort to promote world peace. During the original stunt she wore a white gown and gave audience members scissors to cut away the fabric. She remained motionless until she was left completely naked. Now she will invite guests to once again cut away postcard-sized pieces from her dress at the Theatre Le Ranelagh and ask them "send it to the one you love". The original Cut Piece performance took place before she met and married the late Beatle Lennon. It has gone down as one of most outrageous conceptual art performances, and has been widely copied by other artists. Ono said she wanted to recreate the event because of political changes since the 11 September tragedies. "Force and intimidation were in the air. People were silenced," she said. "Cut Piece is my hope for world peace. When I first performed this work, in 1964, I did it with some anger and turbulence in my heart. "This time I do it with love for you, for me, and for the world."